A Payment Voucher Templates is created ideal for business transactions and purposes. It is one of the important written documents that every business must keep. It serves as a formal document needed in every transaction to be made between the potential customers or clients and the business companies where payments and terms for payment are stated. 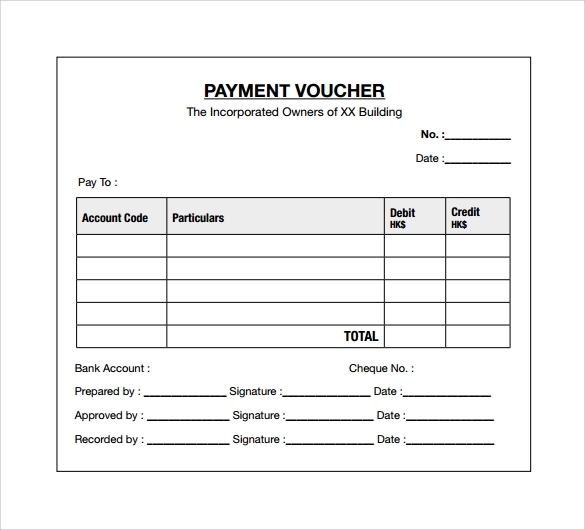 Aside from these purposes of having a payment voucher, this may set to utilize as a commercial receipt also provided that there is an authority for allowing it.The benefits that the business companies can get from using a payment Blank Voucher Templates are the following: they can be useful in cases of future references, act as record of payments and statement of transaction. 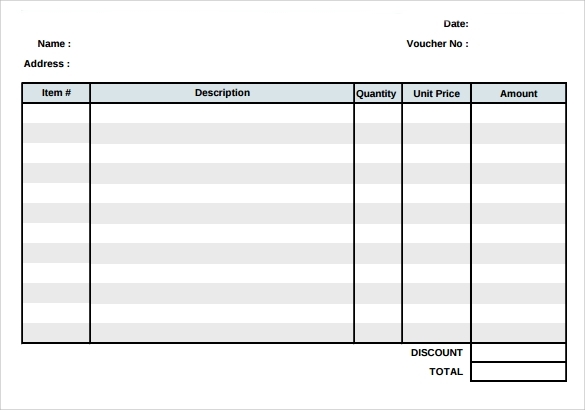 This is a sample company’s payment voucher in PDF format. It contains a table in which you can write the account code, particulars, debit and credit done. There are other details of the payment info that need to be mentioned in the voucher too. You can download this template and make a professional looking payment voucher within seconds. 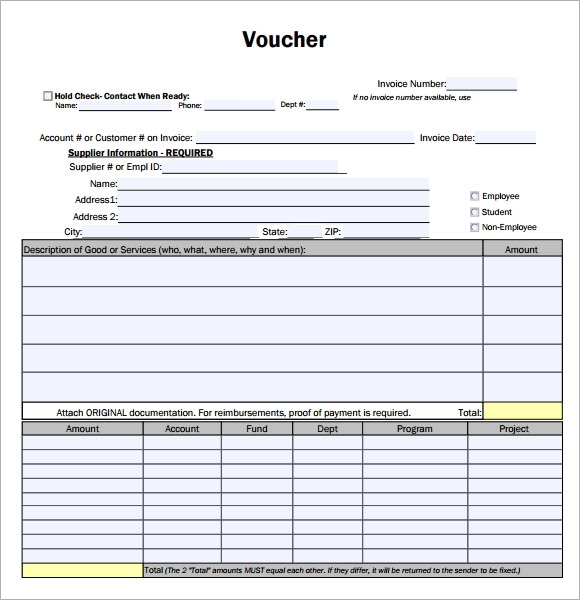 This template allows you to create a detailed payment voucher that contains details of the goods or services delivered, along with the payment details. It is an easy to download and fill up voucher template that you can use to create a payment voucher consisting of all the necessary details, including the party details and payment details. 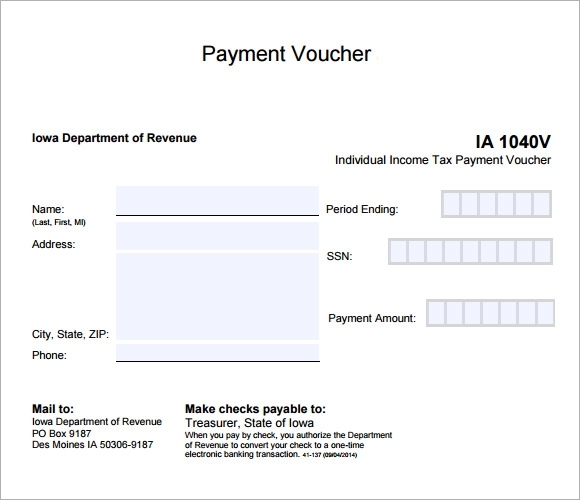 This is a sample payment voucher from Iowa Department of Revenue. Along with the party details and the payment details, it contains information about the address of the party and to whom the payment checks have to be addressed. It also contains the SSN and period ending of the agreement. This is a blank payment voucher template that you have to completely fill up yourself. Just download it and print out to create a payment voucher by hand. It contains the voucher number and other details, followed by a table in which you will have to write the item number, its description, its quantity, unit price and the amount to be paid. Thus, creating a template for a payment voucher is very useful and helpful for all companies and institutions. Aside that it provides time and cost saving, this templates are readily seen as quick as possible in the website. The users can have it customize as per the need and requirement of the business. 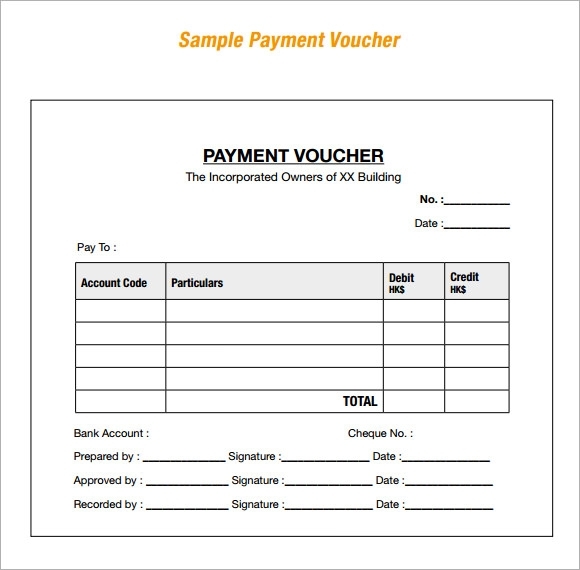 Why Do You Need a Sample Payment Voucher Template? A payment voucher is a proof of any monetary transaction taking place between two parties. As far as businesses are concerned, they use it for different purposes, such as to use it in place of cash during a transaction, to use it as a receipt, or to indicate approval of an invoice for payment. So, if you are also involved in any kind of cash transaction, a payment voucher can come to your help. These sample payment voucher templates can actually help you in creating payment voucher with expertise. You may like Blank Voucher Templates. 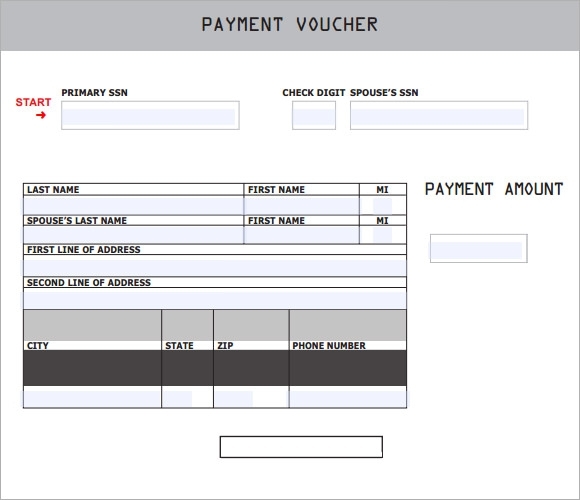 When Do You Need a Sample Payment Voucher Template? 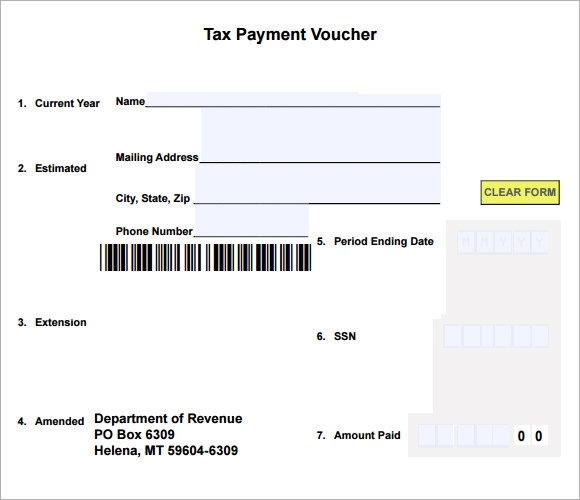 A payment voucher is an important document used to indicate a payment. When a person pays money to another person or party, he has to fill out a payment voucher to tell the reason of payment and to indicate that the payment has been made. Most of the times, these payment vouchers are kept stores in files for accounting record reasons. They can be numbered or unnumbered, depending on the frequency of payments being made. If you are also involved in some kind of payments and transactions, then get them proved with the help of these sample payment voucher templates. 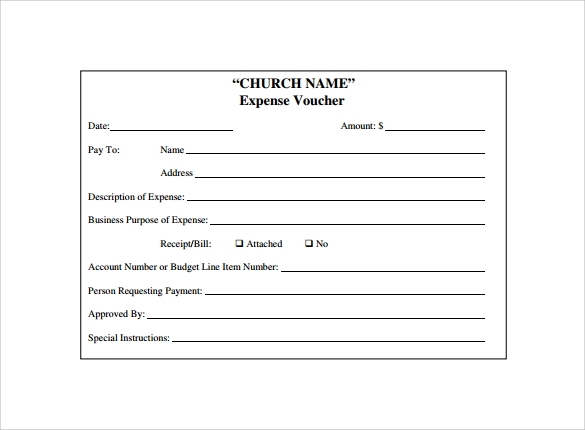 You can also see Petty Cash Voucher Templates. All the sample payment voucher templates available here have been designed by experienced professionals. They are high in quality, and are 100% error free. They can even be customized as per your personal requirements and preferences. Just download and print them to use them as a proof of your payments.